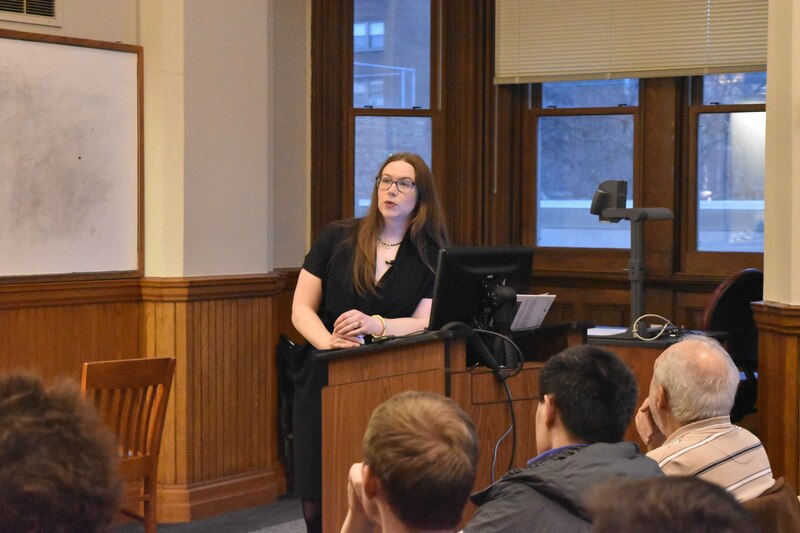 Clare Malone, a FiveThirtyEight.com reporter, returned to her hometown of Cleveland earlier this month and visited CWRU. Malone spoke to students and community members about the Trump presidency and the role of media in current political enviornment. The next day, the FiveThirtyEight.com reporter spent the afternoon speaking on the Case Western Reserve University campus to a packed audience of students, staff and fans in Clark Hall 309. In a talk titled, “Are There Any Norms Left? What Clues 2016 Offers to America During the Trump Presidency,” she spoke about how politics has changed and the news agencies that cover it. She described herself as a “story girl at a data guy site”. Her background, writing and fact-checking for The New Yorker and other magazines, makes her an anomaly at the site. Malone, who grew up in Shaker Heights. Her brother and father both attended CWRU School of Law. Malone’s brother in particular had his car saran wrapped by a fraternities after parking illegally in their lot. However, Malone put this behind her and expressed sincerity at the opportunity to speak about the shattering of “norms” in American discourse and politics. After thanking the audience in her introduction, Malone acknowledged Clark’s newly renovated windows and “Elgin Marble-y bits” lining the walls. For more than a year and a half, Malone, her colleagues at FiveThirtyEight.com and most of the world have been following the events and aftermath of the election cycle. A certain mood of reservedness hung over the room, informed by the lecture topic of presidential politics and the 2016 election. She gave a condensed version of lessons learned from reporting on individuals of all political persuasions and analytical writing for the site. Malone’s work reflects experience as a magazine writer, contrary to the site’s statistical bent. However, it was the empirical approach of FiveThirtyEight.com that came across on Tuesday in her analysis of the recent trends in culture and politics. Her lecture was separated by four answers to big questions about Trump, each hinting at how politics got to where it is and where it is going. After giving a brief “Political Science 101” refresher on the basis of norms and laws in America, the talk delved into a reflection on the campaign. Trump, as a candidate, shattered the mold and hinted at breaking norms as president: offering limited transparency, undermining confidence in democratic processes and especially subverting civility. Malone also took the opportunity to address the failure of her news organization and others to see Trump coming. After gaining a reputation for prescience with their successful poll aggregation models in 2008 and 2012, many expected FiveThirtyEight.com to accurately predict the electoral outcome in 2016. Malone explained that the results were within margins of error for polling but conceded that there were signs of Trump’s success across the midwest that they missed. Malone also questioned why the United States allowed Trump to shatter norms and briefly hypothesized on what he is likely to do as president. The norms Malone drew the most attention to related to civic life. Her concerns were informed by her experience in working for Georgetown University’s branch campus in Qatar. She contrasted the experience of civil participation in America—CWRU’s political student groups, for example—with norms of an illiberal democracy. Her message was that this type of experience relied heavily on egalitarian conventions rather than legislation. The floor was opened up for questions. In line with someone who asked John McAfee to his face if he killed someone, Malone’s responses to questions were to the point and pertinent. She rejected some of the assumptions students expressed including the assertion that America is living under fascism. She drew on her journalistic background to advocate for clarity when characterizing the new administration, even advocating for using the word ‘lie’ when characterizing untrue statements made by the president. When the apparent discord between the reality show candidate and his working class support elicited snickers, Malone quickly pushed back. This is not to say that Malone had an answer to all concerns. Luxenberg Family Professor of Public Policy Joe White was asked to offer his own predictions for deeper political polarization. He asked Malone if she saw any centrist institution that could prevent more division. She conceded that she was stumped and underscored how uncertain everyone, even the statisticians, are about the future. With partisanship in mind she identified a culture growing coarser. The answer, she said, at least in part, was for individuals to “read widely and be less knee jerk.” During the lecture, she quoted notable thinkers such as Joan Didion, Seamus Heany and Wayne Barrett among others.